Be Sure to check out our Visiting Herdsires too! Rocky is a beautiful gentle, large and well-proportioned suri male. His awesome presence, with his multi color fleece, makes him stand out in the pasture. His fleece is consistent throughout, displaying lots of luster and lock structure. 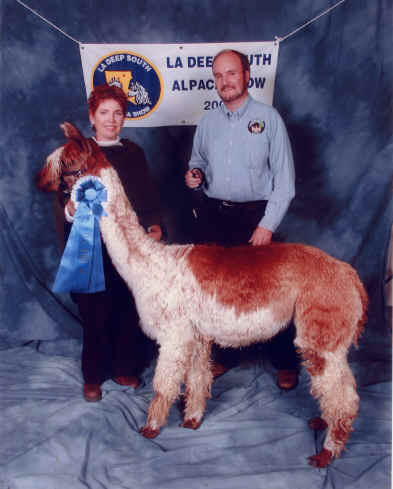 Winning blue ribbons at an early age and at his last shows in adult classes, the judges asked if he was in the breeding program yet. They strongly recommended to get him in the program soon, that we had a winner! 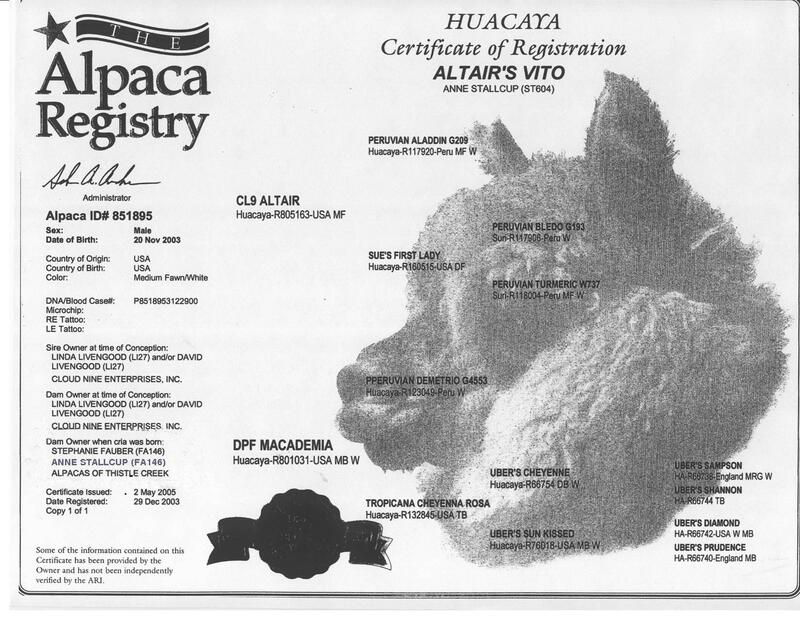 Rocky's sire is Angel's Advocate, a 3/4 Peruvian bay black winner of many awards. Rocky offers a complete package, with his beautiful fleece coverage from the tip of the ears to the tips of his toes, strong conformation and a true-to-type suri head. Rocky's stud fee is $1500. Call or email to reserve your breeding today! Starbuck has always stood out in the herd as one of our large and conformationally strong suri males. His fiber is consistent throughout, displaying lots of luster and lock structure. Starbuck is medium fawn with white frosting on top - like coffee with cream on top, hence the name Starbuck. He won blue ribbons at an early age and won Grand Champion as a yearling in a large class of all yearling and adult suri males and females at the Houston Livestock Show in 2006. 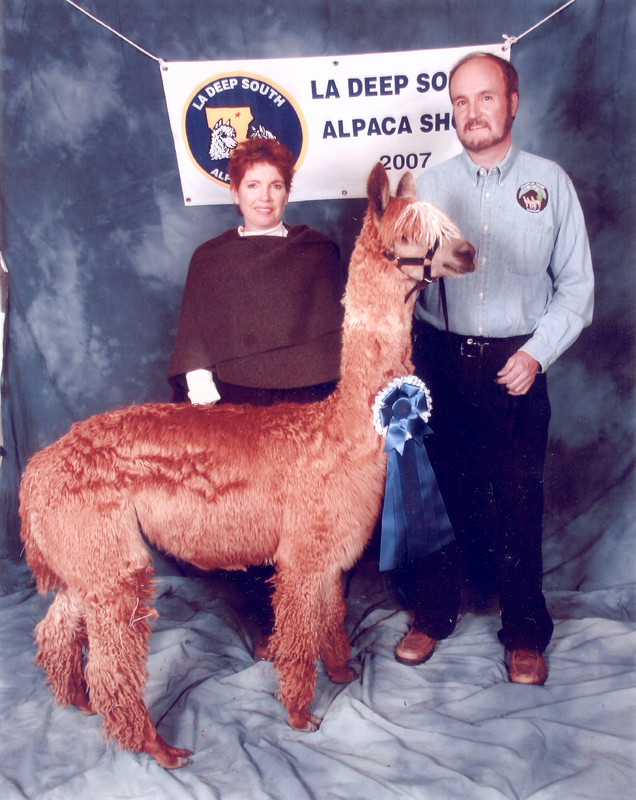 The judges say they look forward to seeing him in our breeding program. 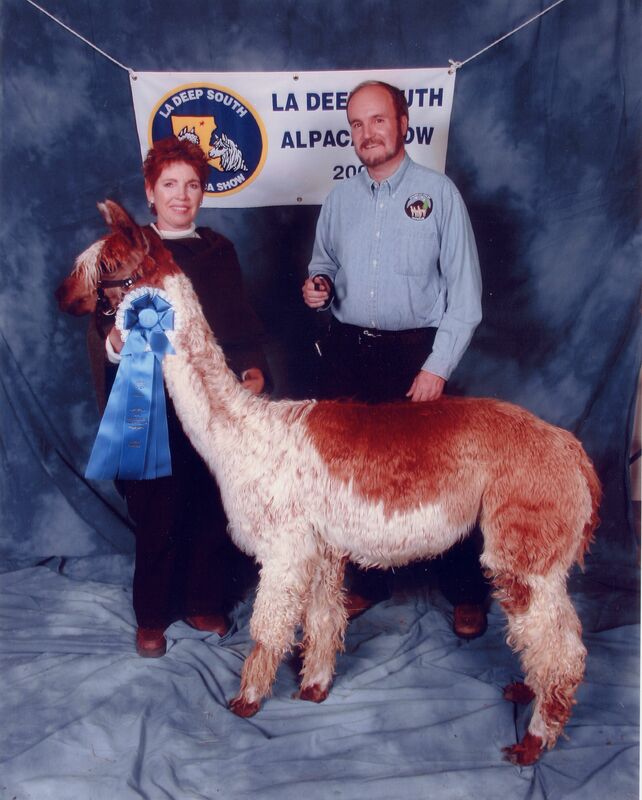 Starbuck settled his first female last spring for an April 2008 cria. Starbuck's stud fee is $1500. Call or email to reserve your breeding today! Click here to download a PDF Flyer with information about Rocky (including show results). Cisco is a nice light brown huacaya male. He is the son of Andean Pride and grandson of Magical Farms Dracula. Cisco is a nice solid male with a good top line and soft, dense fleece. Cisco's stud fee is $1200. Call or email to reserve your breeding today! Click here to download a PDF Flyer with information about Cisco (including show results).